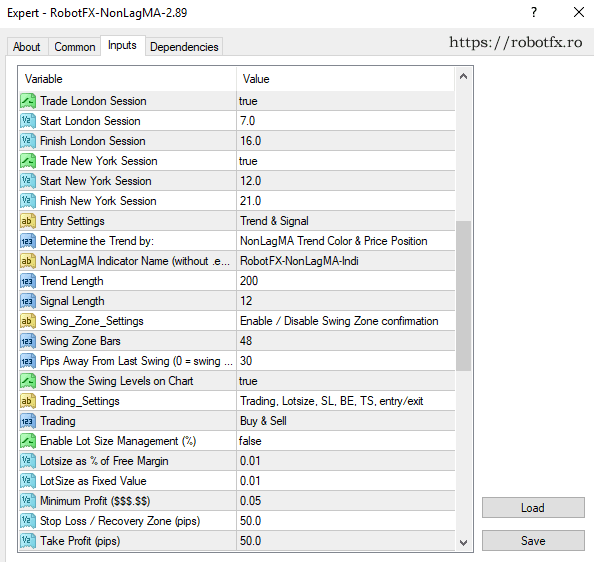 The RobotFX NonLagMA expert advisor is a trading tool designed for traders trading with the trend and whose forex trading strategy is defined by the “trend is your friend” motto. This Metatrader expert advisor is similar to the Fluid expert adviser and its main functions are basically the same. The EA can detect the trend and trade accordingly, as well as hedge and recover the losses from a losing trade. Of course, classic stop-loss, break-even and trailing stop are also possible. The trend can be defined by the color of the trend nonlagma, the price position regarding this nonlagma or both (see pic above) of these options. For the EA to consider closing a trade or a basket of trades at the non-lag moving average signal, the profit must be higher or equal to the MinProfit. To trade using the expert advisor as it was designed to do, the trader must first choose an option for the EA to establish the trend. This will be accomplished by the trend nonlagma detector and it can be based on the indicator’s color (black=sell, white=buy), the price position regarding the nonlagma trend indicator (price above = buy, price below = sell) or both of these criteria. The second nonlagma indicator is used to enter - and if the trader chooses so, to exit - a trade. Exiting a trade at the nonlagma reverse signal may ensure that the trader has closed the trade at the right moment, just before the trend would reverse. For the experienced traders, there is the possibility to enable the martingale and to double/triple/etc the next trade’s lotsize, if the previous one was a loss.